In moments of grief there’s really nothing you can do except to say a few warming words about the deceased and present your condolences to the sorrowful family and friends. Only time will help the bereaved to heal from the loss. How much of it will be needed is relative. It depends on the relationship between the grieving and the deceased. Funerals have the most oppressive atmosphere of ubiquitous sadness. Nothing can compare to a place where people are gathered to say their final Funeral Flowers Deliverygoodbye to someone who they’ll never see again. Only the most precious memories of that person emerge in your memory in such a moment. There should be something that can ease the atmosphere a little. Flowers can help. Flower Shops offers flower delivery services to any address you want, whether a church, a funeral home or the departed’s house. 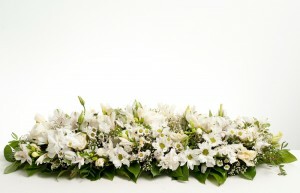 We understand and sympathize with your pain, and we’ll be as tactful as possible when we deliver the Funeral Flowers. The attitude of our staff corresponds to the occasion for which we deliver the flowers. If you’re not familiar with the type of flowers that are appropriate for a funeral, we can give you advice on that before you order from us. Have you ever wondered why flowers are suitable for a sad occasion like a funeral? The reason is that when they stand at the background with all their beauty, they can bring calmness and warmth. That’s why Funeral Flowers should look subtle and not too overwhelming. After all, the attention should be focused on the deceased and the grieving family. The emotions in such a situation are intense, so it’s not usually appropriate to have a bright flower bouquet in the background. It’s better to choose lighter pastel colours for such a bouquet. Out of respect to the departed you should take your time when choosing the proper Funeral Flowers. Flower Shops offers different types of sympathy flowers. Since these flowers are intended for the family, you might consider something that’s appropriate for the day and that won’t offend them in any way. There are certain flower bouquets that are usually ordered as sympathy gifts. Then, we have posies and flowers in a basket if you Delivered to the Funeral Homewant something different. Commonly, the posy is in a white or cream colour, and it conveys to delicacy and elegance. A sumptuous basket of flowers can show how much the departed meant to you and that you care about his family. Wreaths look more substantial and are frequently ordered for funerals as well. What words can’t say could be expressed with flowers. In some way, flowers intended for a funeral serve as a facilitator when words aren’t enough to express how sorry you are and how much you want to support the mourning family. As something irreversible, death is the saddest thing that could happen to someone extremely close to you. And the healing process after that can be long, but you have to know that the pain fades away with time. The memory of the deceased will rest in your heart forever, though. 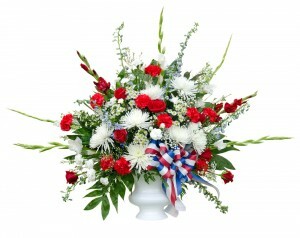 Our company takes your sorrow seriously and will make sure to deliver your flowers without any issues on the way. Your flower arrangements will look perfect and you won’t have to worry about being disrespectful by sending wilted flowers. We can assure you that your flowers will be delivered on time because punctuality is one of the things we focus on when doing our job. This is our phone number – ‎020 3900 2440. Feel free to call if you have any other questions regarding flowers.